Are you also minding your own personal business or you are the type that interfere to the matter you are not called to? Well, whatever your answer maybe, you need to listen to this dope song. Vector is a king on his niche when it comes to the “Raps Game” and Olamide is a street banger on his own talkless of how he use his voice to control the streets. 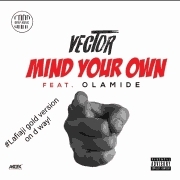 The duo, Vector & Olamide has something to tell us in this song. Nobody knows what Vector is trying to voice out, maybe because it has been long he release a single and his competitors or backslashers are condemning him. Did I say nobody knows what the duo wanted to voiced out? Oh, I forget, somebody knows it and who is that?